When Google bought the Frommer's line of travel guides from Wiley in August 2012 it seemed more than likely Google was only interested in the digital value of the content they had just acquired. That supposition was confirmed earlier this week with the news that Arthur Frommer, whose 1957 guide book launched the Frommer's imprint, is going to license the Frommer's brand and content and continue to publish travel guides in print. That's good news for the few who still rely on paper travel guides, because 2 weeks ago Skift reported that Google had ceased production of new editions of Frommer's travel guides that should have been on schedule for a Fall release. Many authors had told Skift that their contracts were being cancelled or that the publication date was indefinitely delayed. That news came as something of a shock to me, because even though Google didn't care about the print editions I would have thought they would still want the content so it can be used digitally. 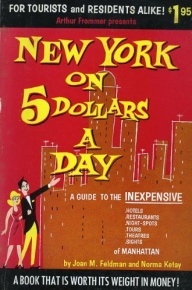 Travel guides are one of the types of content that goes stale quickly, and Frommer's had usually published new editions annually. Absent those new editions, Google's $22 million investment would lose value fast. In fact, now that I can look at it with the benefit of hindsight it seems that Google made a mistake last year when they bought Frommer's but neglected to arranged the sale of the print rights that Google had no interest in. But now that Arthur Frommer is taking over the brand that oversight has been rectified.